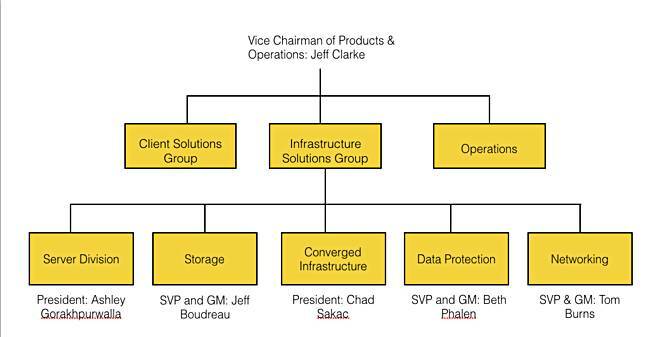 Dell has split up and distributed the Chad Sakac-led Converged Platforms and Solutions Division (CPSD) across company's existing server, storage and networking units (Infrastructure Solutions Group). CPSD handled the rapidly growing hyperconverged infrastructure (HCI) and converged infrastructure (CI) products. The HCI set included the XC (OEM'd from Nutanix), VxRack, VxRail and ScaleIO. VxBlocks are in the CI set. CPSD also owned the Enterprise Hybrid Cloud and Native Hybrid Cloud products. It looks like the servers unit gets the HCI products – VxRail, VxRack, VxRack FLEX and XC, plus the cloudy bits. The storage unit gets VxBlocks and Vscale and ScaleIO. Storage unit head Jeff Boudreau will manage the Cisco relationship. Tom Burns' networking unit will get operations and R&D for VxBlock and Vscale, and drive the next-generation CI strategy. Armughan Ahmad, who was SVP for Blueprint Solutions and Technology Alliances and running a Ready Solutions business, cedes these responsibilities elsewhere but stays on as a Dell team member. Infrastructure Solutions Group marketing is now led by Sam Grocott. Each of the business units – servers, storage, data protection and networking – is responsible for its own profits and losses. Matt Baker, who has become SVP for strategy and planning in the Infrastructure Solutions Group, said the reorganisation paralleled others elsewhere in Dell that aimed to enhance the efficiency of sales and operations. We also understand overall Infrastructure Solutions Group head Jeff Clarke wants his organisation to be integrated as one team that operates in a crisper, faster and more focused, informed way. We expect he's thinking there will be no loss of HCI focus by having it become part of the overall server business unit. Chad Sakac, who was CPSD president, is described as an extremely valuable member of Dell's community, and is working out a new role. There are no changes in titles and general responsibilities in the management levels below Chad, as the parts of his organisation are being lifted and shifted into the servers, storage and networking units. There is no change to Beth Phalen's data protection unit. Chief integration officer Rory Read relinquishes Infrastructure Solutions Group strategy and quality responsibilities to Jeff Clarke's team. Cathy Arledge has a business transformation role working with Ashley Gorakhpurwalla's server business, and this gets widened to cover all of the Infrastructure Solutions Group. We could view this as the next stage in the integration of the acquired EMC business by Dell. 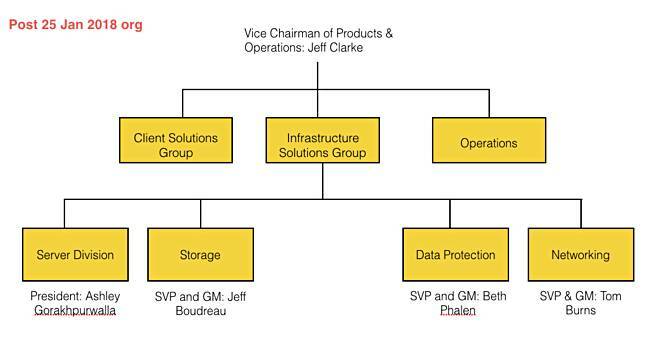 It looks like Beth Phalen (data protection) and Jeff Boudreau (storage) are the only ex-EMC execs at SVP level or above who still look after recognisably EMC business units inside the Infrastructure Solutions Group. Dell executives run the servers and networking businesses.